My husband and I are going on a road trip this summer and we won’t be staying at the Marriott. Not just because 4-star hotels are too expensive. Where we’re headed, we’ll be lucky to find a Super 8. More likely we’ll end up in budget motels with names like Willow the Wisp and All Tucked Inn. 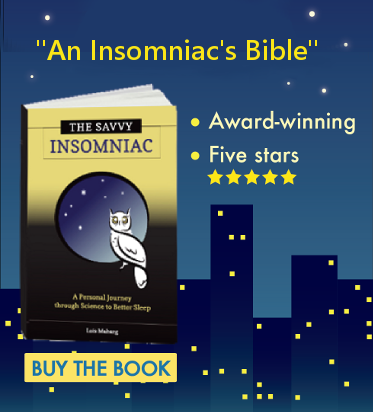 Being the finicky sleeper that I am, I carry the potential for insomniac nights wherever I go. At least a dozen possible hazards can throw my sleep off track. Here’s what I do to boost my chances of getting better sleep on the road. Being the finicky sleeper that I am, I carry the potential for insomniac nights wherever I go. (But hey, a new study found that even good sleepers tend to sleep less soundly the first night they’re sleeping in an unfamiliar place. This is called “first-night effect.”) At least a dozen possible hazards can throw my sleep off track. Here’s what I do to boost my chances of getting better sleep on the road. (1) Pack earplugs. Not just one set but two, in case one gets lost or left behind. I use silicone earplugs that mold to the shape of the ear and form an airtight seal. Some people prefer to mask noise at night. My sister uses a white noise machine. A friend of mine packs along a small fan. (2) Open the conversation in the office by saying I’m looking for a room that’s QUIET. Then I choose the room strategically. I take one facing away from the road when possible. If plenty of rooms are available, I ask for one far away from others currently occupied. I don’t care if they think I’m a misanthrope. I can’t be nice to my fellow human beings after a night of rowdy partying in the room next door. (3) Check the appliances for potential noise. Does the refrigerator sound like a Mack truck? I’m out of there in a red-hot second. Does the A/C shut off with a loud judder? Same thing. And neighbors whose TV is blaring when I inspect the room are not necessarily going to want to turn it down. (4) Pack along an eye mask. My eye mask is lightweight and molds to my face so it blocks out light but isn’t too hot to wear. (5) Pack a mini-flashlight. A middle-of-the-night trip to a bathroom with bright fluorescent lighting can sabotage my sleep for the rest of the night. A flashlight is the answer here. A night light can work, too—if you remember to pack it up in the morning. (6) Check out the A/C to make sure it works and that I can control the thermostat. A/C whose only setting keeps the room in a deep freeze is just not good enough. (7) Pack along a lightweight blanket. Bed linen at motels these days consists of sheets and a comforter or a quilted bedspread—which means I either freeze or boil. Yes, my body cools down at night. But to stay comfortable what I need is a lightweight blanket, not a so-called comforter. I guess I’m high maintenance traveler. Aren’t you glad you’re not coming on the trip? Good idea about the blanket. These roadside motels DO pose a challenge for the sleepless. I always pack earplugs, but room temp can also be an issue for me. Thanks for the tip! Great ideas! Something I am very sensitive to, and that can keep me awake, are odors, whether from animals, insufficient cleaning, or air fresheners. When I enter a motel room, if I immediately notice an odor, I ask for another room–or even find a different motel. I have been reading this blog now for quite some time. I so love this posting, Lois!!! Traveling for the sleepless is quite the challenge indeed. What about scratchy pillow cases and sheets. UGH!! When you have been to much nicer hotels, you really sense the difference. Also, the quality of the mattress. I feel like the Princess and the Pea!! I would like to know how you and others cope with the exhaustion of no sleep when on a trip or away from home. I am sure many can relate to just “getting thru” the day after being up most of the night. Sometimes I up my sleep meds when traveling because of these issues you all mention. I have a question I would like to ask about Klonopin for sleep, but do not want to digress on this section if not appropriate. Thank you, Lois, for taking the time to research and manage this VERY helpful blog!!! Yes, scratchy pillow cases and sheets, as well as lumpy pillows, are one more challenge for people who have trouble sleeping! The question about traveling and insomnia deserves some thought—and another blog post. Look for it later this summer. Re: Klonopin, I don’t have any personal experience with the drug. People I’ve spoken with give mixed reviews. 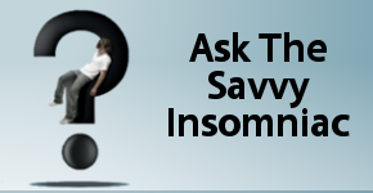 Why don’t you contact me through Ask the Savvy Insomniac, and I’ll get back to you with what I know and can find out. Thanks for writing in—and for your appreciation of the blog.